In-Camera 4K Recording. The C300 Mark II 4K Camera captures 4096 × 2160 4K (that’s DCI, not UHD) at 24/25/30fps internally in a trio of XF-AVC H.264 codecs. Twin 3G-SDI outputs enable 4K RAW output to a supporting external recorder for maximum quality. It also offers Over Sampling HD for capturing 2K / Full HD video at a variety of frame rates up to 120fps. Canon 8.85 Megapixel Super 35mm CMOS Sensor. This new 16:9 CMOS sensor as mentioned above provides 4K capture, but that’s not its only claim to fame. It also improves on many of its predecessor’s already great specs. The Dual DiG!C DV 5 image processors offer 15 stops of dynamic range (12 stops in the original), improved high ISOperformance up to 102.400 and a high-speed readout for reduced rolling-shutter distortion. Dual Pixel CMOS AF. This upgraded system has phase-detection autofocus with two photodiodes at each pixel, offering greatly improved speed and accuracy. The focus area has been expanded to 80% both horizontally and vertically, giving you maximum coverage for tracking your subject. A new feature is the Dual Pixel Focus Guide which displays focus-assist information on the screen, enabling the user to easily see front and back-focusing. Canon Log Gamma 2. Designed to take advantage of the C300 Mark II’s 10-bit recording capability, the files produced using Log format enable a large degree of color correction/grading in post-production with minimal image degradation. Canon touts that it offers dynamic range up to 1600%. Canon EF Lens Mount. 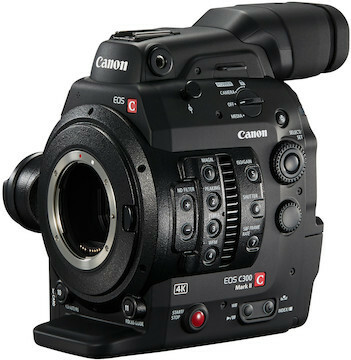 The Canon EOS C300 Mark II is compatible with all of Canon’s new EF Cinema lenses and servo-zooms, as well as current EF lenses, including compact primes, super telephotos, specialty tilt-shift, macro and fisheye – over 100 in all. Refined Ergonomics. Like its predecessor, the Mark II features a modular design with removable components depending on your needs. Besides a different layout for buttons, memory cards, battery, and input / outputs, the Mark II also includes an improved low-angle top handle with additional mounting points. There’s a new 1.77mp OLED EVFthat provides greater color reproduction, contrast and response. Connectivity. The camera is equipped with two 3G-SDI, a genlock input, a time code input/output, and an HDMIoutput. Additionally, the camera’s various “assist-displays” including waveform monitor, edge monitor, peaking, zebra and magnify, can be output through SDI and HDMI. The C300MkII comes standard with (2) UN-5 1.6ft audio / video cables. If you need more flexibility in mounting, we also rent the Canon UN-10 3.3ft Monitor Cable Pair for C300 Mark II. Dual CFast 2.0 Slots. To support the extremely high amount of data transferred for 4K capture, the C300II records to CFast 2.0 memory cards. There’s also a single SD card slot for simultaneously capturing 2K / Full HD video and proxy recording.